When I was a child the choice of a gift for Father’s Day was simple. Either handkerchiefs or a tie was wrapped and presented at breakfast. Handkerchiefs have been replaced with paper tissues and since “casual” Friday now means “don’t wear jeans with holes” these choices of gifts have mostly been replaced with personal electronics and at a greater price tag. While there a several career positions that require the “coat and tie” dress code most tie collections have been put aside. This fashion accessory doesn’t look quite the same when worn with a tee shirt. There have been many types of neckwear worn by men: bandanas, fancy lace ruffs and collars, cravats, ascots, bolo and bow ties. But since my gifts were traditional “ties” I decided to learn a little more about their history. The internet information is quite broad but the general consensus is that 1. The Terracotta Army of the first Chinese Emperor (221BC) wore as part of their uniform a cloth tie around their necks and 2. 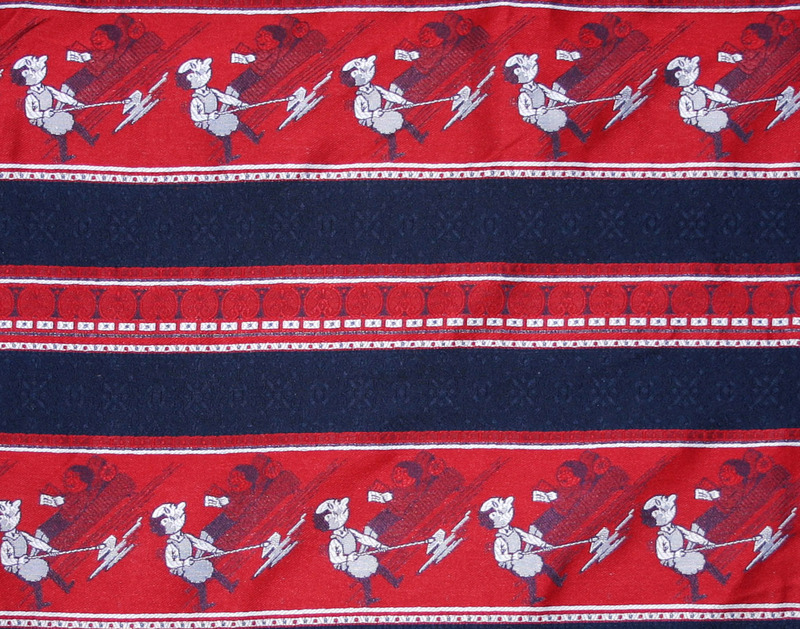 The Croations wore such neck cloths and the word “cravat” came from this source. One resource even showed a demonstration on how to properly tie the “tie”, the most common knot being the “four in hand”. 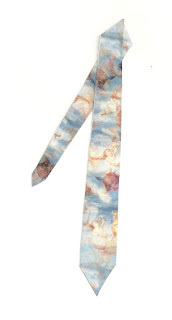 Perhaps the most famous knot is the Windsor Knot named after the Duke of Windsor. The modern tie is made of three pieces of fabric, cut on the bias and sewn together. Besides the patterned fabric there is also lining and interfacing fabrics. The standard length is 57 inches but the widths vary with the style of the day. Remember the super wide and the very skinny ones? 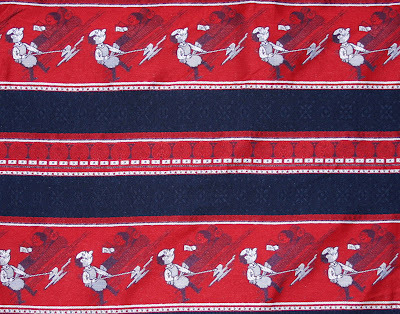 This tie fabric shows a man doing housework while his wife reclines on the sofa. I can imagine the reaction when this gift was opened.